Later this month, Washington DC will once again have the honor to host the National Cherry Blossom Festival. For one month, starting on March 20, until its end on April 17, people from all over the coutry and throughout the world have a chance to see 3000 cherry trees in the West Potomac Park bloom in their characteristic white and pink colors. This is accompanied by many events throughout the city, celebrating the friendship between the USA and Japan, as well as welcoming spring. 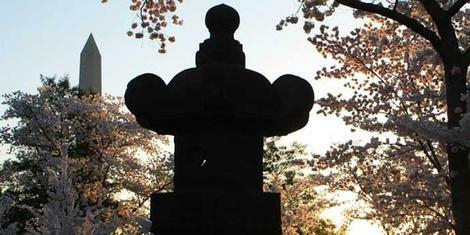 The National Cherry Blossom Festival grew immensely over the past century, now spanning four weekends. From its small beginnings in 1927, to the 5 week long festivities 2012, the festival is held in commemoration of the gift of three thousand cherry trees from Tokyo's Mayor Yukio Ozaki (1858-1954) to the city of Washington, dating back to 1912. Since the planting of the first trees, the first ladies of the United States have traditionally been involved in the festivities, recent ones serving as Honorary Chair. Peak bloom, when most of the buds will be open, is estimated to be around April 4. However festivities start as early as March 18 with the Pink Tie Party, a fundraiser for the National Cherry Blossom Festival. The celebrations include free events such as a kite festival on April 2 at the Washington Monument, fireworks with live music on April 8 on the Southwest Waterfront, a parade on Constitution Avenue on April 16. For other events you will need tickets, for example the Sakura Matsuri street festival on April 16 with a small admission fee of $10 ($8 advance purchase), or the Cherry Blast in the Carnegie Library.